A couple of years ago at the Faber Jesuit Community where he lived, the Rev. Daniel Harrington participated in a discussion centering on the question of what inspired the panelists to greet each new day. When he was a boy with a stammer, a biblical passage gave him the courage to persevere and pursue the priesthood and teaching. A New Testament course in Greek fired his imagination as a novitiate. The Bible then provided his life’s work as he summarized tens of thousands of books and articles as editor of “New Testament Abstracts,” all the while writing more than 60 books of his own. Rev. Harrington, who taught for many years at the Weston Jesuit School of Theology in Cambridge, and more recently at the Boston College School of Theology and Ministry, died of prostate cancer Feb. 7 in the Campion Center in Weston. He was 73. A gifted and patient teacher known for rendering complex theological thoughts into understandable lessons, he guided students, wrote prolifically, and preached at two Masses at two churches every Sunday. Rev. Harrington also “was a great sports fan to the point where he could write a sports column,” Clifford added. “I know more about sports unfortunately than I know about Scripture sometimes,” Rev. Harrington, who was a hockey goalie for four years at Boston College High School, said in the oral history. The younger of two brothers, Daniel J. Harrington grew up in Arlington. His father was an Irish immigrant from County Cork who finished a high school equivalency in the United States and was head of shipping and receiving at a Sears. His mother graduated from Arlington High School before marrying and becoming a homemaker. He went on to study at Boston College and at Harvard University, where he was a Woodrow Wilson fellow, and where John Strugnell, a top editor of the Dead Sea Scrolls, was an important mentor. Rev. Harrington contributed his first piece to “New Testament Abstracts” in 1962 and became editor a decade later. He also wrote a column in America Magazine for a few years. 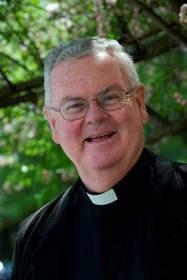 Drafting a homily for last Wednesday’s funeral Mass in St. Ignatius Church in Chestnut Hill, Stegman wrote that Rev. Harrington once mentioned he had applied for only one doctoral program, at Harvard, because he judged it perfect for him. “I then asked him, ‘But what if you didn’t get accepted?’ He simply replied, ‘I put things in God’s hands. If it was God’s will, I’d be accepted. Otherwise, I would have been happy to teach Latin at Boston College High School,’ ” Stegman wrote. Although the Lord’s Prayer was Rev. Harrington’s favorite prayer, when facing life’s challenges he often turned to the biblical passage about Moses he first read as a child.